The Triassic marks the final stages of Pangea’s amalgamation during which the North and South China blocks collided resulting in the formation of the ultra-high pressure metamorphic Qinling-Dabie Shan orogenic belt. The start of the Jurassic saw the break-up of Pangea. 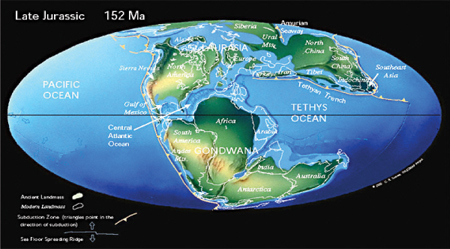 It began with the separation of North America and Africa and the formation of the Central Atlantic Ocean followed by the break-up of the great southern continent Gondwana eventually separating into South America, Africa, Antarctica, Madagascar, India and Australia. By the end of Cretaceous, the majority of the continents we are familiar with today had begun to assume their modern forms.